Ever wondered…How can I live a ‘good’ life? How can I find peace in a busy world? How can I find community in a world of individuals? How can I find meaning in my work? We don’t have all the answers, but come and meet others asking the same kind of questions. The Community of St Etheldreda gathers for prayer, worship, discussion, and reflection in and around Ely Cathedral. We share food together, we enjoy each other’s company and journey with each other in faith. Our rhythm of community life is based loosely on the Rule of St Benedict, written 900years ago. The Rule guides people in the life of Christian community and still offers a pattern for living in the world today. You can be involved as much or as little as you like. There are different kinds of activities for different kinds of people. For those who want to go deeper, there is a simple act of personal commitment, which helps lay foundations for Christian living. 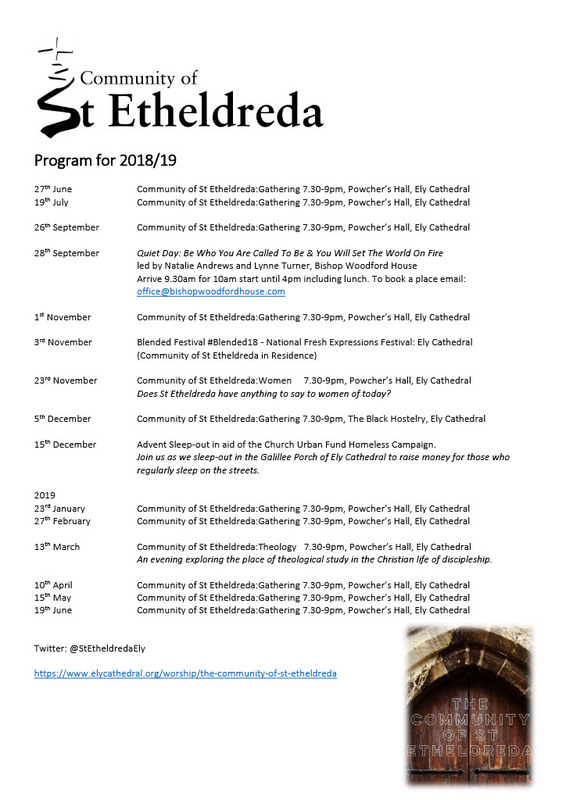 The Community of St Etheldreda also hopes to be a missional community, that is, we look outwards to the world and its needs, and seek to transform it for the good. St Etheldreda is an inspiration for those seeking to live an authentic Christian life in the world today. Her faith inspired her to establish a monastery, which formed the foundation of Ely Cathedral. Obedience: The latin root means to listen intently to God. In our world today there is a lot of talking but not much listening! The call is to listen to God through his word, through silence and contemplation, through quiet days, retreats and meditations, through the ministry and guidance of others, through prayer and through corporate worship, which is the real ‘work of God’. Those who hear the word are called to let it shape their lives. Stability: This is important for us in an age of constant change- what gives us an ‘anchor’ in life? We all have a need to belong and to be content within a stable Christian community, learning to live together in love even with those we find most difficult and learning to live in the present moment, and not be distracted or worried by the ‘if’s’, ‘but’s’ and ‘maybe’s’ that clamour for our attention. Work: The call to reflect God’s creative activity including practical service, however humble, for the benefit of all. This may include outdoor activities and care for the environment, charitable events, and even menial tasks for the good of the wider community, as well as study and reflection on living out our faith in practice. This would be particularly relevant to those in secular employment. Transformation: A commitment to be changed, to see the need for it, to seek to realise all the potential that God has put within us, to be open to God’s transforming love and grace in us, to become more Christ-like. Also, to seek to transformation of all that is unjust in our world today. Obedience: Listening to God through daily prayer, reading God’s word, silence and regular times of retreat and worship. Stability: by being part of an ongoing community where I can meet Christ in others and be challenged by those who know me well. Work: In my daily life seeking to serve others in practical ways, witness to Christ and proclaim his kingdom of justice and peace.